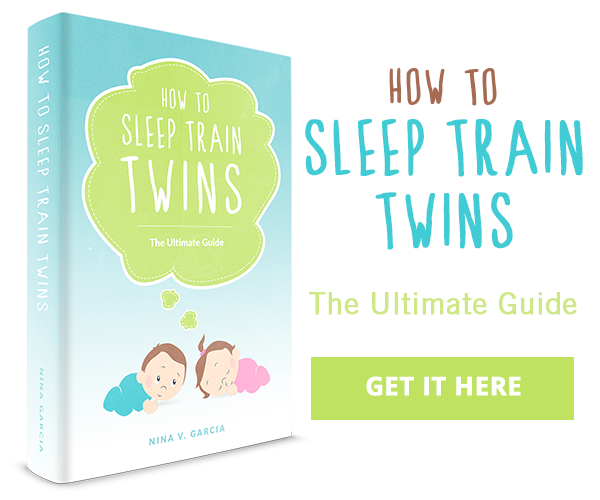 How do you know your twins are ready to move out of their cribs and into a bed? They tell you. Just how they tell you is what makes this part of twin parenting interesting. Moving twins into beds can be quite the adventure. Your toddler twins might ask about a bed, or mention how they don’t like their crib anymore, or may even show you they can be left unsupervised safely. However, your twins might just show you by their actions. Just like our girls. When our girls were a little past two years old, my wife and I were talking on a Sunday night when we heard a thump from the girls’ room. I went to investigate and found one of our girls standing next to her sister’s crib, talking with her. I put the jail breaker back in her crib and said good night. Almost as soon as I closed the door, I heard that same thump sound. I went in again and saw that the offender had a very large I’m-proud-of-myself smile on her face. I put her back into the crib and told her to stay put. The sudden reality that our girls could escape their cribs at any time required immediate action on our part. My wife and I quickly discussed the safety issues and our options. Since both girls were still awake, we went into the room and took the girls’ crib mattresses out and put them on the floor. We told them they were big girls now and that they got to sleep in big girl beds. Well, they didn’t buy it. They bounced around, played, and turned their light on and off for about an hour. We realized our mistake and went and put them back in their cribs (after several unsuccessful interventions). We got the escape artist to stay in her crib by tying a large bed sheet over the top of the crib on each of the four corners. It was enough of a deterrent to buy us the time we needed to resolve the issue the following day. The next day was a holiday so we scrambled to get the girls ready for their official big girl beds. We got our boys’ box springs down from the attic, bought two new twin mattresses, and took the girls to the store to make a big deal out of buying new sheets and such for their big girl beds. The girls were really excited for their new beds and redesigned bedroom. Unfortunately, they were so excited that sleep wasn’t a top priority. We removed anything that could break from the room as a safety measure and even put child-proof knobs on the door handle on the inside of the room and on the handle to the closet so they wouldn’t escape or get into more trouble. We hoped that all the fanfare about getting big girl beds would help them settle into the routine. We tucked the girls into bed after saying prayers and as soon as we said goodnight and closed the door, they turned into Twinadoes. The girls pulled all of their clothes out of their drawers, played with toys, bounced on the beds, yelled, screamed, and had a merry old time. We went in occasionally when we heard cries of pain (typically when one had fallen off the bed), and got them tucked back into their beds. Nevertheless, they weren’t calming down even after an hour and a half. So I went into the room and unscrewed the light bulbs from the overhead light and took the nightlight with me. Without any light to guide their mischievous activities, they finally fell asleep close to 10:00 PM which was about 2.5 hours later than their normal bedtime. Tuesday night we kept the night light in the room, and did the go-to-bed routine. As soon as Mom left the room, they bounced up and started playing again. With the overhead light bulbs missing, they only had the nightlight to see with. Nevertheless, that was enough to once again empty every dresser drawer and throw all their clothes on the floor. There was loud playing, talking, screaming, and even banging/kicking on the door and wall. We tried to ignore all the noise but it was so loud that we feared it would wake up their sleeping brothers in the other room. Unfortunately, we found that if we went into the room it seemed to reset the timer on their play and they would just continue that much longer. As with the night before, there were some cries of pain and I’d go into the room to soothe and put the girls back in their beds. They must have been extra tired or perhaps they were just getting used to the routine because by 8:30 PM the room was quiet and we assumed they were on their way to Dreamland. On the third night, we did the bedtime routine: prayers, tuck in, songs, and left the girls in their room. They played and made noise but overall were quieter than the previous nights. Around 8:15 PM one girl started crying like something was wrong. I went into the room (which was dark) and fumbled for the night light. It was missing. The non-crying girl had it in her hands, with the light bulb in one hand and the fixture in the other hand. I put the night light back together and plugged it in. I tucked the girls back into bed and left. Ten minutes later, I heard cries again. The room was dark and once again the nightlight thief was clutching her prize. I plugged it in behind the dressers so the girls couldn’t reach it, tucked them in and said good night. They fell asleep shortly thereafter. The girls didn’t empty their dresser drawers this evening. Hooray! The girls skipped their naps today so they were treated to an early bedtime. Good news: all was quiet in the house by 7:10 PM. My wife peeked in on the girls at this time and they were both–amazingly–sleeping on their own beds. On the weekend, my wife and I went out on a date each night and the babysitter reported no problems getting the girls down to bed. By the time we got home, they were asleep on their beds. Be consistent. Follow the bed time routine even if the twins immediately pop up out of bed. Expect one or both to fall out of bed during the night. You may just put their mattresses directly on the floor to reduce the change of injury. Try to prevent the twins from opening the door. Use child-proof handles on the inside, or if their handle has a lock, switch the handle so the lock is on the outside of the room. You could even gate the doorway if your twins aren’t likely to jump the gate. Give it some time. The transition won’t happen overnight. It may take days or even weeks. Remember to be patient and consistent and eventually your twins will come around to the new normal. Good luck! 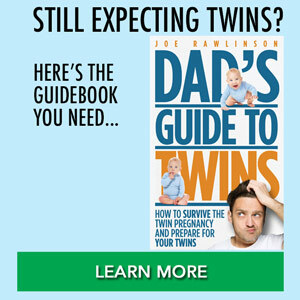 I talk more about getting your twins to sleep (and overcoming those challenges) in Chapter 5 of my book, the Dad’s Guide to Raising Twins: How to Thrive as a Father of Twins. 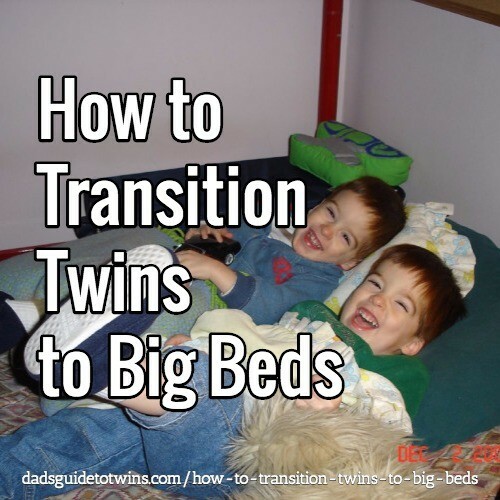 If you’ve already transitioned your twins out of cribs and into big beds, what worked for you? Let us know in the comments. Just found your blog. Love it. We have two-and-a-half year old twin girls and had a jailbreak last night. Looks like we’ll be getting beds soon. @Kristen – good luck with the transition. Our jailbreak came sooner than we expected so it accelerated our move to big beds. I have 2 year old twins are just moved them to big girl beds after three nights of them getting out of there cribs and going crazy. My question is what did you do for naps? We are on day 4 of big girls beds and my girls are so tired. One wants to sleep but her sister gets out of bed and jumps on her and wakes her up. I count on nap times to help them catch up but if I leave them alone to sleep they end up awake till nap time is suppose to be over. Any suggestions? Our girls are 3 now. We have only had one escape attempt during a naptime many months ago. However, since they are getting older, we are having the discussion of when and how. I have read so many different things and loved your blog. My question is placement of the matresses. Did you place them side by side, close but not touching, or farther apart? @Alicia – We started with two mattresses on the floor at opposite ends of the room. We had them in the corners so that two sides of the bed were against a wall. Our girls typically wake up around the same time. However, when one wakes up before the other, she will typically come find mommy or daddy first thing instead of waking up her sister. Try to set expectations with your girls. Tell them to come find you when they wake up and let her sister sleep (or whatever arrangement you’d like). Good luck in the transition! Thanks for the tips. I was thinking of moving our 2.5 year old twins to big kid beds tonight but instead will follow your tips to build some excitement around it and do it this weekend after some excitement leading up to it. By the way I love the term Twinadoes! @Todd – Building up excitement definitely helped us so I hope it works for you too. Good luck with the transition to big beds! @Helene – How did the transition go? I hope it was smooth and that your kids are getting in a good routine now. @Robin – We had to separate our girls during nap time so they would actually sleep and not play with each other the entire time. You might consider that as an option for day time. At night, you might need to sit in with them briefly to make sure they are doing what they should. Excelent! We have twin boys who are 2 1/2 ,,, and an “older” brother who is 4 1/2 !! The bigger is in his own room and big bed. Twins share a room and They sleep in cribs yet. We aré going to begin the transition but we are “temerous” of the older brother to enter for a “nignt plarty” (Sometimes he express his desire of sleep with his brothers because feels “lonely”. May be your aproach could help us. I mean the relax attitude and let the routine habits to Works. @Andrea – good luck with the transition! As you saw with our experience it will take some time but you can help them form good habits. I just wanted to say thank you for the tips. Our son has been in a toddler bed for months, but we have been unable to get his sister out of her crib. While they are only 2.5, we wanted to try to switch before vacation this summer. Yet every time we tried chaos ensued and we lost patience. Tonight we tried with a room darkening curtain and a door knob cover and an hour of them playing and they were both asleep! @Amanda- congratulations on the success! I hope your vacation goes smoothly too. @Kelly – you might have to stay in with them a bit to calm them down but you should leave the room so they can learn to fall asleep by themselves. This may require you go in several times before they fall asleep. Good luck with the transition!